My flight with Icelandic air was pretty uneventful. Well apart from my name being announced on speaker to the entire J F Kennedy airport. I was asked to report to the main desk. My heart leapt, I could not deal with any more flight issues. I sped over to find out that a couple of my tax receipts from entering Honduras had fallen out my passport when checking in. I took a sigh of relief, these were very unimportant after existing Honduras. My flight to Iceland left shortly after on time. I managed to get a couple of hours of sleep before arriving in the very cold Iceland. It was – 2 degrees and pitch black at the early hour of 6.15am. I caught a shuttle bus to the hostel, which worked out very well. As I descended from the bus I hurriedly took myself and bags inside seeking warmth. KEX hostel was through a rusty door and up a set of grubby looking staircases. I am used to crummy hostels, so was not too bothered. 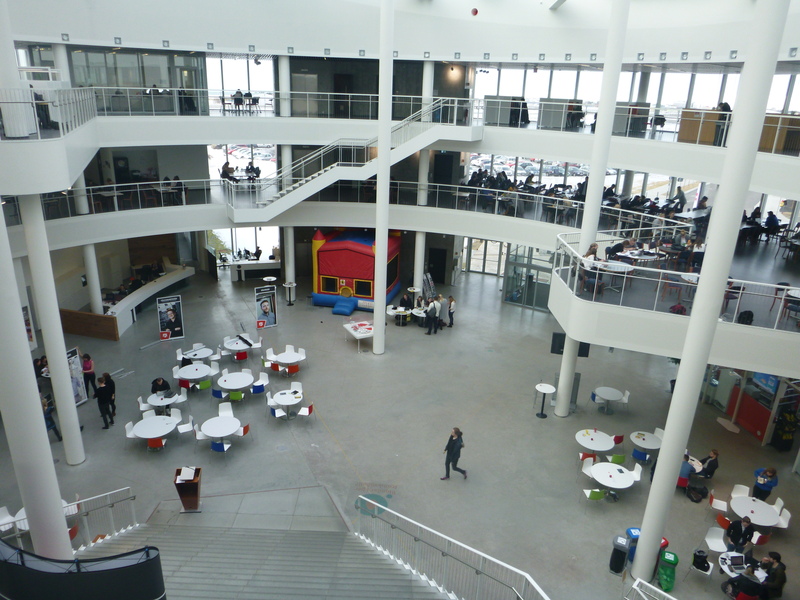 However, on reaching the reception and common room area I was very pleasantly surprised. The communal area was super cool, with wacky bookshelves, relaxing candle lit seating areas, quirky decor and even a trendy, lively bar. Not only this but the view was outstanding. 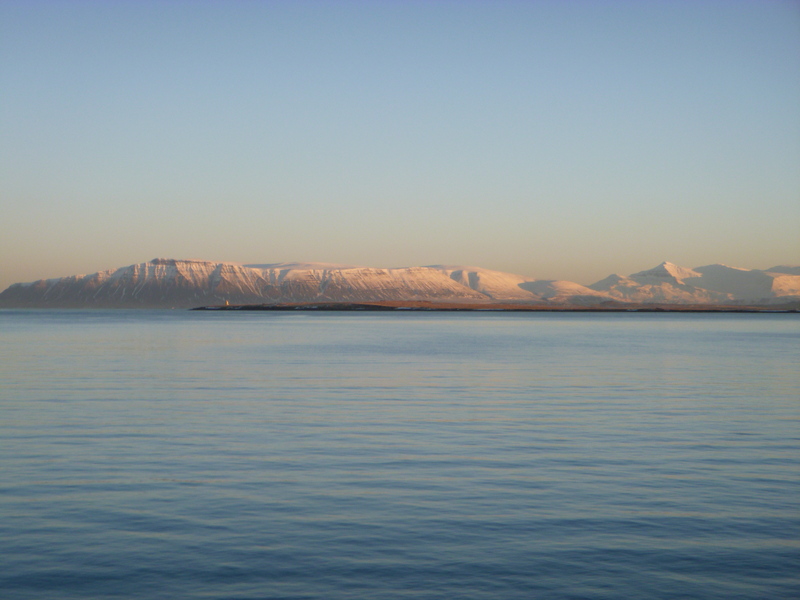 From the long, rectangular windows you could see Rekavik harbour and it’s surrounding ice capped mountains. Such a different terrain and picture to what I have been used to seeing the past few months – it was a fabulous change. I had a quick walk along the harbour and roam around the town, looking into some very expensive shops selling touristy gimmicks, books and boutique clothes. 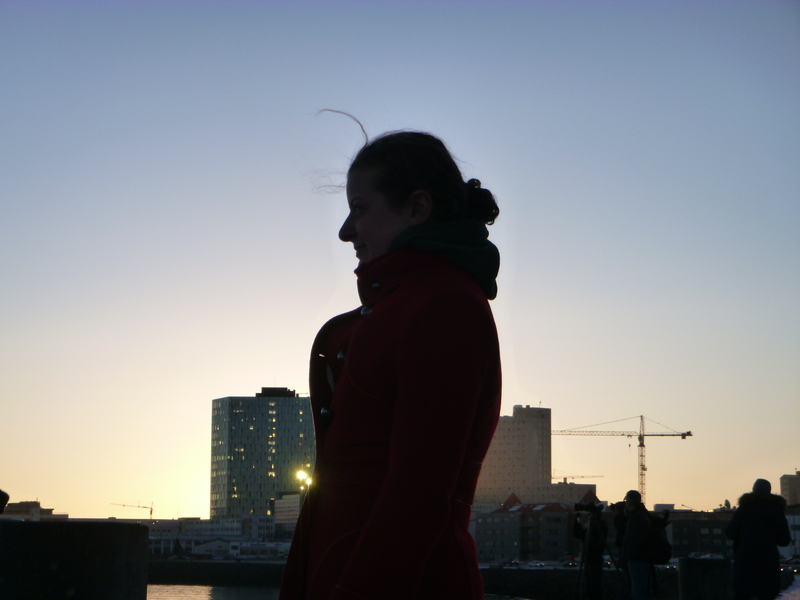 Walking along the beautiful harbour I took a moment to stand and admire the view as the sun rose I to the sky. A Chinese guy started taking pictures of me and I looked at him confused. Then figured if he was going to take pictures he may as well do it on my camera too. I’m guessing my new red coat made a dramatic picture against the white snow. I was used to having my picture taken in central America – people were fascinated by the white skin but in Iceland, I did not expect the same. Nonetheless, u just thought to myself there is never a dull moment when traveling. On arriving back to the hostel I was ready to take a shuttle bus to the blue lagoon (one of the 25 world wonders). I knew the bus was close when I saw plumes of white steam spiraling into the biting cold air. The huge thermal natural spring was super relaxing. Walking into the sub zero outdoors with just swimwear on was utterly freezing. I rushed over to the hot pool and warmed up in no time. It was surreal seeing staff members in coats shivering while I felt almost too hot. A combination of the natural salts, heat and beautiful mountainous, snowy scenery allowed me to fully relax, forgetting the fact that I had missed a night of sleep. I stood under a naturally heated waterfall which gushed down onto my shoulders giving me a massage. I made friends with a Colombian and we hung out in the pool for a couple more hours. Natural silica body masks were being offered. I smothered myself in the white natural remedy. For guests who chose the luxury option an additional face mask was given. Although I had the standard entry pass, my friend had the luxury and so I was given a face mask too – possibly out of pity. Regardless, I enjoyed my freebie mask before having a sit in a sauna looking out onto the beautiful thermal pool. 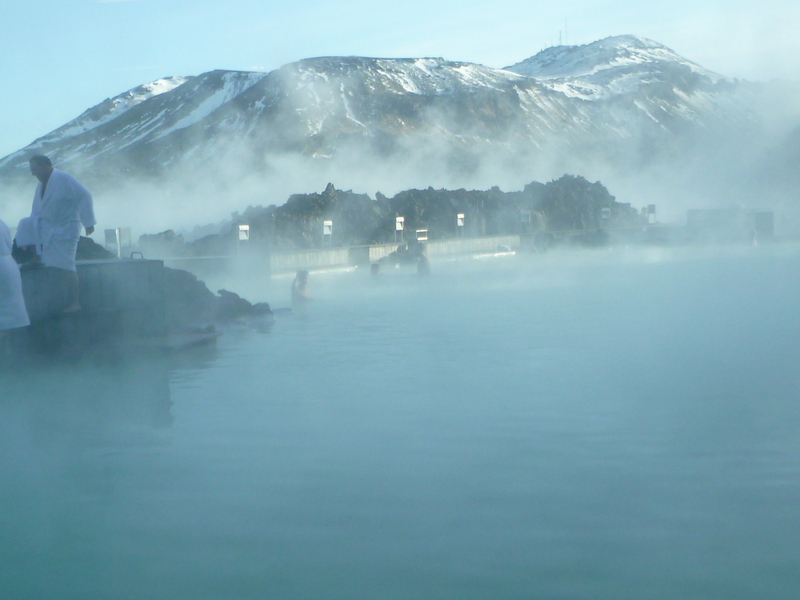 The Blue Lagoon was the perfect way to unwind after a night flight. The next day, to recover from my jet lag I decided rather than booking on a tour to spend a day by myself and check out some local trails. After a luxurious lie in, I began walking to the Hallgrimskirkja church. Here you can pay a fee and line up for ages to get to the top of the tower. As it was already lunch time and others had told me that there were better views in the Perlan dome I continued my walk. 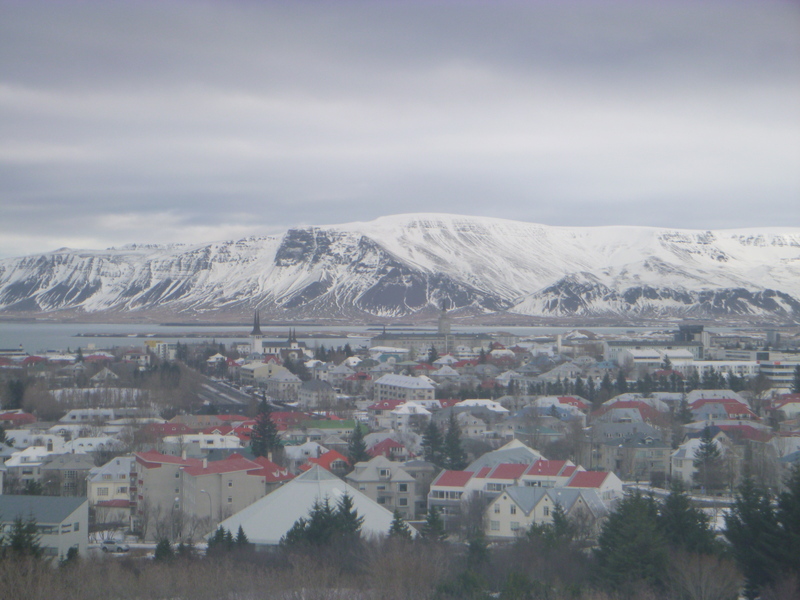 I enjoyed walking through Reykjavik and taking in the stunning mountain backdrop. I reached the impressive Perlan building which was a dome structure and wondered in. I was amazed by the fantastic views over the city and surrounding snow covered mountains. I spotted the vast church jutting out in the city scape. Red roofed houses looked pretty against the white snow. Although the landscape was pretty grey, white and bleak, it looked phenomenal. Snow patterned the mountains with striations. It was obvious where the weather and ice had eroded the terrain. I warmed up a bit inside the posh Perlan before continuing my journey. 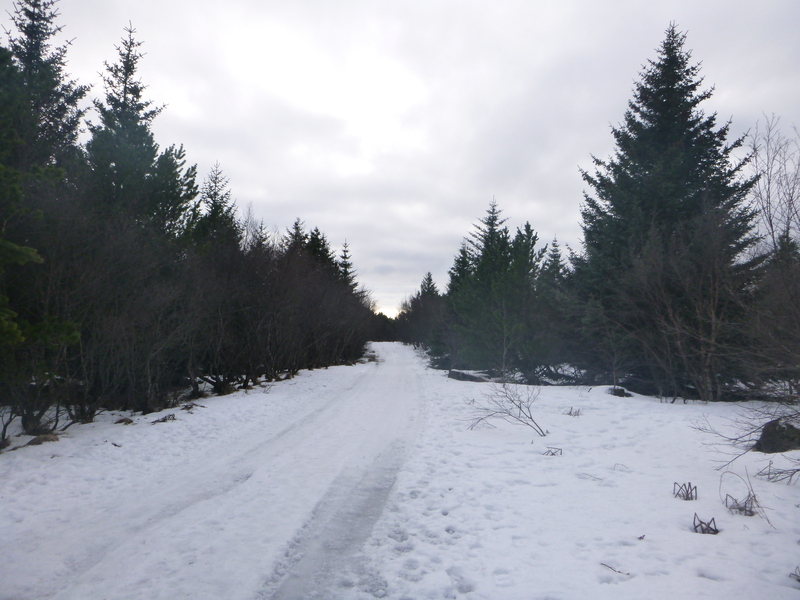 The trails began from the dome, taking me through snowy forests. Step by step I made sure to keep my balance – not always an easy task. After some downhill I reached a university, so decided to pop in. It was extremely modern and clean. Students sat around next to large windows, studying. With a view like that I am not sure how they got any work done. I would be studying the scenic mountains rather than my textbook. 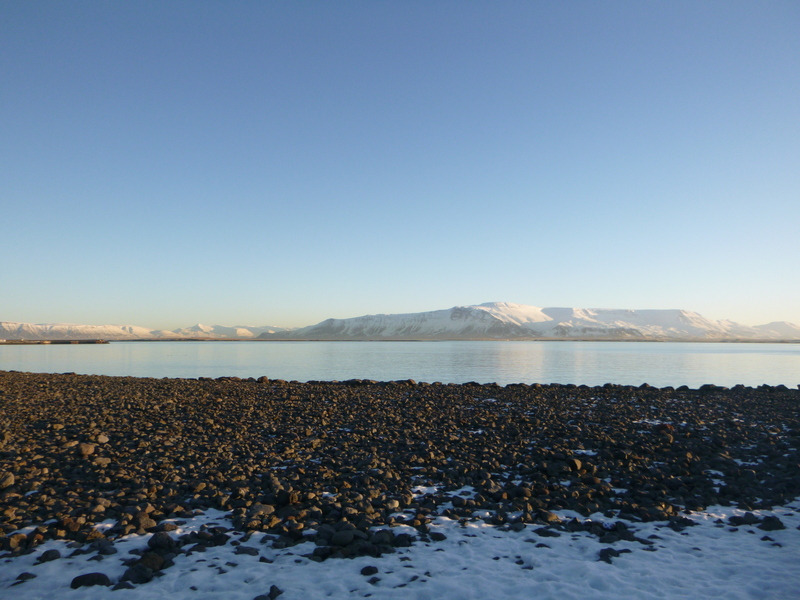 I walked to the shore looking over the sea once more before returning to Reykjavik downtown. A nice cup of herble tea and an typical Icelandic lamb soup was on the cards for dinner. I really enjoyed my whistle-stop tour of Iceland. It is a beautiful country which has so much to offer. I hope one day I can return and do some tours, to see more or hire a car. In two days, I got a lot done while managing to rest too. Next stop – London, Heathrow. Stay tuned for more travel tips and how to explore London on a budget.